Love books? Want books? The Friends of the Seattle Public Library invite you to indulge at the Public Huge Book Sale 2019, Saturday and Sunday, March 16 and 17, in the Exhibition Hall at the Seattle Center. Over 100,000 items will be for sale, with over 50 categories of nonfiction, including art, cookbooks, crafts, gardening, history, music, performing arts, pets, nature, and travel. The fiction section includes science fiction, graphic novel, classics, and short stories. (Poetry isn’t mentioned in the description, but hey, you KNOW there will be poetry!) The children’s selection covers every reading level plus several special categories such as folk & fairy tales, history, and nature. Over 15 languages are represented in the foreign languages section, plus there will be a vast selection of DVDs, CDs, audio books, and records. Whew. Purchases benefit the Library. More on Facebook. Would you like to present a poetry reading, workshop, installation, or other activity to a poetry-friendly audience? Then it’s time to make a proposal for the 2019 Poets in the Park. The free annual event, to be held Saturday, July 20, 2019, 11:00 am to 6:00 pm, at Anderson Park in Redmond will also include a no-commission book fair, vendors, craft activities, open-mic readings, and free ice cream, so mark your calendar. If you have an activity to propose, please contact Michael Dylan Welch at WelchM@aol.com as soon as possible. Readings should feature groups, organizations, journals, or anthologies, but if you have other unique ideas, those are welcome too. 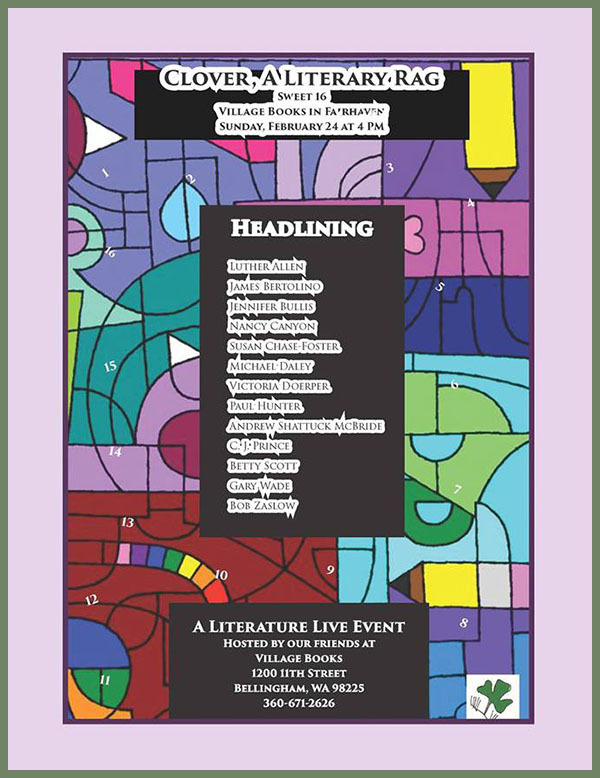 Clover: A Literary Rag celebrates Sweet 16 today as a selection of contributors to volume 16 share their words. Featured authors are Luther Allen, James Bertolino, Jennifer Bullis, Nancy Canyon, Susan Chase-Foster, Michael Daley, Victoria Doerper, Paul Hunter, Andrew Shattuck McBride, C.J. Prince, Betty Scott, Gary Wade, and Bob Zaslow. Join in the celebration at 4:00pm at Village Books in Bellingham. It’s free, and copies of Clover will be available for purchase and signing. The three pieces are also recorded without the vocals on “Winter – Music of Eric Ewazen and David Snow” featuring Chris Gekker on trumpet and Ted Guerrant on piano.